Dimensions 45'6" by 35'8" by 12'4"
Power plant 1 690 hp (514 kW) Bristol Pegasus IIIM3 nine-cylinder radial engine driving a three bladed propeller. The Mk.II had a more powerful engine and rocket racks under the lower wings. The lower wings were metal skinned to take the weight of the rockets. The Mk.III was equipped with ASV Mk.X radar. The Fairey Swordfish, known as "Stringbag" to its crews, was a painfully obsolete aircraft, typical of what the Fleet Air Arm had to work with early in the war. Though very maneuverable, it was also very slow. It was more successful than it had any right to be, but this was mostly because it was employed in the Atlantic and other distant areas where enemy naval air opposition was ineffective. Its two greatest feats were crippling the Bismarck (where there was no enemy air opposition at all, and the Bismarck's antiaircraft fire proved astonishingly ineffective) and sinking two Italian battleships at Taranto (where the raid went in at night and achieved a considerable measure of surprise.) 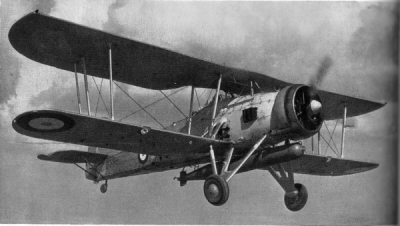 The Swordfish was almost entirely ineffective in the Malaya campaign, where it was present in small numbers, and the British Far East Fleet was fortunate to never meet a Japanese carrier task force head on. The design dated to 1933, with the prototype first flying on 17 April 1934. The Swordfish entered squadron service in July 1936. It was officially designated as a torpedo-spotter-reconnaissance aircraft, or TSR, intended to locate the enemy fleet, slow it with torpedo strikes, then spot the gunfire of the British battle line when it caught up with the enemy: "Find, Fix, and Strike", as the Fleet Air Arm motto expressed it. Production continued as late as June 1944, in part because of the failure of its intended successors. It has been speculated that the reason for the success of the Swordfish against the Bismarck is that the antiaircraft directors on the Bismarck were not designed with so slow an aircraft in mind.